From Buzzfeed News: “All of this optimization — as children, in college, online — culminates in the dominant millennial condition, regardless of class or race or location: burnout. 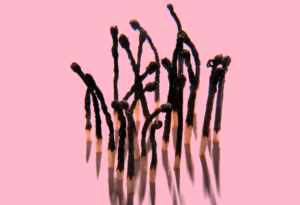 ‘Burnout’ was first recognized as a psychological diagnosis in 1974, applied by psychologist Herbert Freudenberger to cases of ‘physical or mental collapse caused by overwork or stress.’ Burnout is of a substantively different category than ‘exhaustion,’ although it’s related. Exhaustion means going to the point where you can’t go any further; burnout means reaching that point and pushing yourself to keep going, whether for days or weeks or years. In his writing about burnout, Cohen is careful to note that it has antecedents; ‘melancholic world-weariness,’ as he puts it, is noted in the book of Ecclesiastes, diagnosed by Hippocrates, and endemic to the Renaissance, a symptom of bewilderment with the feeling of ‘relentless change.’ In the late 1800s, ‘neurasthenia,’ or nervous exhaustion, afflicted patients run down by the ‘pace and strain of modern industrial life.’ Burnout differs in its intensity and its prevalence: It isn’t an affliction experienced by relatively few that evidences the darker qualities of change but, increasingly, and particularly among millennials, the contemporary condition. This is why the fundamental criticism of millennials — that we’re lazy and entitled — is so frustrating: We hustle so hard that we’ve figured out how to avoid wasting time eating meals and are called entitled for asking for fair compensation and benefits like working remotely (so we can live in affordable cities), adequate health care, or 401(k)s (so we can theoretically stop working at some point before the day we die). We’re called whiny for talking frankly about just how much we do work, or how exhausted we are by it. But because overworking for less money isn’t always visible — because job hunting now means trawling LinkedIn, because ‘overtime’ now means replying to emails in bed — the extent of our labor is often ignored, or degraded. I’ve been sharing this article to everyone I know today. Thanks for boosting the signal.